Jorethang in Sikkim is a major town. A town with a temperate climate, it can be found on the way to Pelling - close to Rangeet River, the tributary of the river Teesta. Jorethang of Sikkim can be found situated at an elevation of 300 metres above sea level and can be found on the way to Pelling from Darjeeling, Kalimpong and Siliguri. It is present at the foot of hills, below which the river of Rangeet flows. Jorathang has a few interesting attractions in and around it. Present a few kilometers ahead of the town are the Hot Springs which are off late becoming a major tourist attraction. The Maghe Mela of Jorethang is also an interesting event to be witnessed if you are anywhere close by to the town during January. 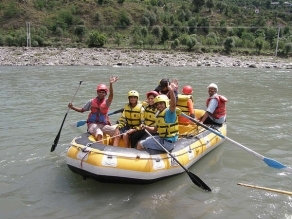 And some of the interesting activities that one can take to during a tour to Jorethang include river rafting and trekking. Every year during the month of January, organized at Jorethang is a famous fair called the Maghe Mela. And the same is organized to introduce tourists, to the richness in culture and traditions in practice among the residents of Jorethang and its surrounding hill stations. It is believed that this fair came into being with the first agricultural fair of Jorethang organized in the year 1955. The Maghe Mela is quite popular among tourists and includes some interesting things and activities such as a cultural expo by the Sikkimese community members, the Jorethanf marathon, fashion show, cultural dance contests, hot balloon show, para-gliding, river rafting, beauty pageant and archery contest - to name a few. Jorethang is easily accessible from all the major cities of India by air, rail or road. Jorethang has a pleasant climate throughout the year. Jorethang is situated on the way to Pelling from Darjeeling, Kalimpong and Siliguri and is well connected by buses and jeeps and private cars. The nearest railway station to Jorethang is the New Jaipaigui (near Siiguri). It is present at a distance of 92 km from Jorethang. The nearest helipad to Jorethang is the one at Namchi which is at a distance of about 25 km.